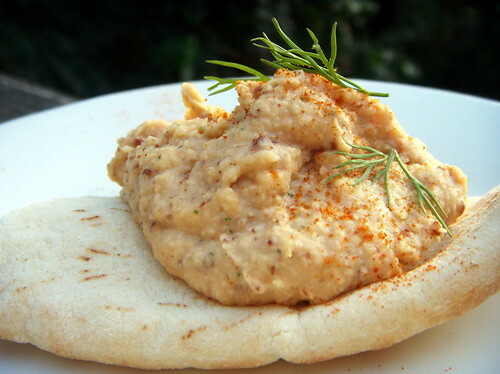 flax seed, cashew, and dill hummus, originally uploaded by aarn! +28th August, 2008+. ground up a clove of garlic, some olive oil, cashew butter (interesting spin on tahini), a tablespoon or so of ground flax seed, some of the hot oil, a splash of sherry, a few sprigs of fresh dill, a small plum tomato that had been fire roasted and skinned, some sea salt and pepper, and some leftover strained and rinsed chick peas. kind of brings up the question: what can't you put flax seed in? WOW... this is so something I would come up with... but I didn't! So I will just have to borrow your recipe and try it out. It looks amazing! All your photos taste delicious... through the screen and with the use of my imagination of course:) Great blog by the way!